As I stated in Part 1 of this article, your cover letter and resume “should “realistically net a 30% to 75% success rate in terms of being contacted by your targeted employers. Those percentages are based on the ranges that our Guerrilla Job Seeker clients have enjoyed to date, even in this recession ! 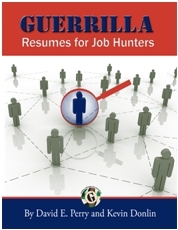 As a practicing Executive Search Professional (aka Head Hunter), a Certified Guerrilla Job Search Coach and a contributing co-author of two best selling books on the subject both (published by Wiley) within the last 5 years, what I will say is that your cover letter and resume must pass the 15 – 20 second smell test or you’re toast. Your cover letter must be concise and articulate your value to the point of making that potential employer slam on the on the breaks, come to a complete stop and really pay attention. Likewise, your resume has to deliver a quick and hard one-two knockout punch. Your message has to hit them right between the eyes; because the clock will still be ticking on that 20 – 30 second smell test. So, how would I define “the BASICS” of a “Best Resume” ? Here are just 12 basic ideas to get you started. 1. Your cover letter must be aimed at the one person in the company who genuinely cares about filling the position. I say that because it just stands to reason that the job would not be open if the company did not have a dilemma on their hands in need of resolution. 2. The first thing the recipient at your target employer is going to read, if done properly, is your cover letter. If done as I suggested earlier in this article, this will at least get you on first base. Don’t believe all that blather that recruiters and employers “never” read cover letters. Many people WILL but only if the cover letter is personalized, intriguing, to the point, and begs for more. 3. Sign your cleverly created cover letter in light blue ink. 4. Add a post script at the end of the cover letter using a presumptive sales technique to close it out. 5. Your resume doesn’t necessarily have to be on top grade paper in most cases. Paper in the medium price range will do just fine as will the color of white. 6. Don’t use an ASCII (Plain Text) resume format unless you are expressly instructed to do so. ASCII resumes are first read by computers. To the human eye however appear and most often read like a Microsoft instruction manual. Due to time constrains I have to run for now. Let’s hook up in a day or two at the same place. I’ll outline the next 6 (six) additional points to consider relative to what constitutes a “Best Resume” and also share with you an absolutley astonishing resume success story by a client of ours who did the exact things I am talking about and with astounding results. I hope you join me for Part 3 of this articleand in the meantime, have a Great Guerrilla Day ! Job Ad phrases - what do they really mean?